The first world champion, Wilhelm Steinitz was considered the best player in the world for a period of about 20 years. By virtue of his match and tournament record, Steinitz was probably the best player in the world during the late 1860s and certainly was by the early 1870s. From 1862 to 1894, Steinitz had an unbroken string of 24 match victories. It wasn’t until 1886, in a match versus Johann Zukertort, that a winner was officially given the title of world champion. Steinitz won with a score of ten wins, five losses, and five draws. He then successfully defended his title several times before losing, at the age of 58, to the young Emanuel Lasker. 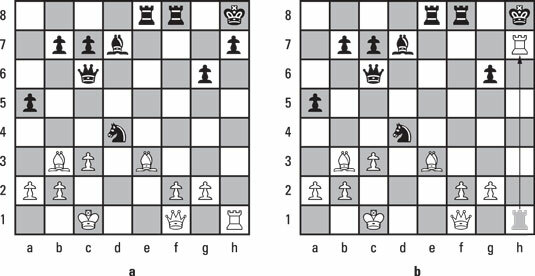 In a world championship match game against the great Russian player Mikhail Chigorin played in 1892 in Havana, the position in part a is reached after the 23rd move of the game. Steinitz finishes Chigorin off with 24. Rxh7+. The obvious move for Steinitz, as white, would have been to play 24. Bxd4+, but that would have allowed black to fight on with 24… . Rf6. Instead, Steinitz administered the coup de grace with 24. Rxh7+. Sacrificing such a large amount of material is counterintuitive to most players. Black resigns, because 28… Kf5 would have been met by 29. g4#.